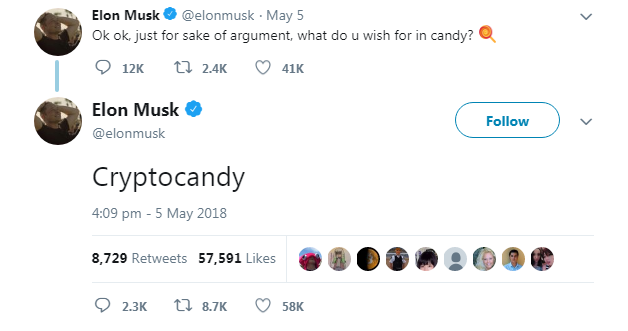 Warren Buffett has come under fire from Elon Musk after an exchange that led to Musk appearing to challenge his rival with a light-hearted ICO dubbed Cryptocandy. The two had been trading opinions via public shareholder meetings in the days prior. The reference to cryptocurrencies played on Buffett’s rigid ideas on bitcoin and his investment in See’s Candy. Elon Musk hasn’t taken a strong stance on cryptocurrencies but represents a newer generation of success believing that “what matters is the pace of innovation, that is the fundamental determinant of competitiveness”. Although Musk has had little to say, he did share that he had been gifted 0.25 bitcoin by a friend years ago and has been noted to have a copy of Cryptocurrencies simply explained. His company Tesla also began accepting bitcoin as a payment method for their electric cars back in 2016. The use of cryptocurrencies played on Buffett’s rigid ideas on bitcoin. Musk is well established in the technology sector and is familiar with online payment systems having co-founded X.com which was acquired by Paypal. After standing as CEO for Paypal he went onto make USD 165 million when the company was bought by eBay. With blockchain expanding into several fields that Musk has invested in alongside his knowledge of payment systems, it would be interesting to hear more of what he has to say. Buffett — a fellow multi-billionaire, on the other hand, has profited largely from his Berkshire’s holdings, which are in food and beverage companies, clothing, materials, insurance, banking, and media. Buffet has continued with his militant stance against cryptocurrencies in particular bitcoin which he recently referred to as “rat poison”.